Just after sunset tonight you will spot the crescent moon above the western horizon. The moon floats between the faint head stars of the constellation Aries and the mythic sisters in the constellation Taurus known as the Pleiades. The moon is five days past new so it still appears to us as a waxing crescent moon. The best place to tour the moon with your binoculars or telescope is right along the terminator – the shadow line dividing the lunar day from the lunar night. The sun’s light reflects from the moon’s illuminated or “day” side. We are seeing only a portion of the day side: a crescent moon. You might notice a faint glow on the darkened portion of the crescent moon tonight. This glow is known as earthshine. Basically, sunlight is shining through Earth’s atmosphere and lighting up the darkened part of the moon. This glow on the moon is exactly like what happens around full moon as seen from Earth, when moonlight floods an earthly landscape, lighting it up. The little star that you might spot near the moon is 41 Arietis, also known in Hindu astrology as Bharani. 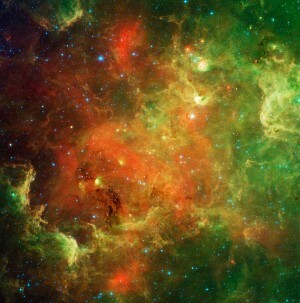 This star is quite dim, so you if you are in the city you may need binoculars to see it. The Pleiades star cluster, otherwise known as the Seven Sisters, should be more obvious above the moon. Tomorrow evening, on Thursday, a larger lunar crescent will meet up with the Pleiades on the sky’s dome. 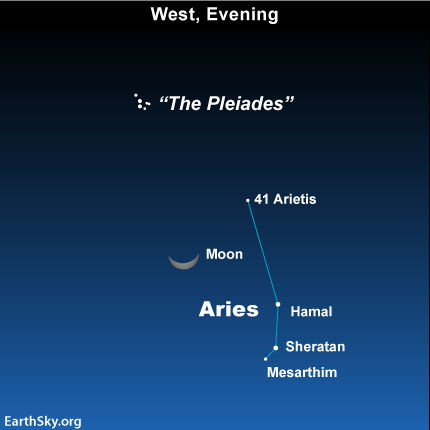 This Wednesday evening, however, the moon will shine below the Pleiades and above the Ram’s head.